The Deep River and Area Horticultural Society had provided the hanging baskets from 1967 until 2012. Town staff water the plants all season and volunteers deadhead them through the late spring, summer and early fall. The Town stores the 14 containers and the canna lilies over the winter. 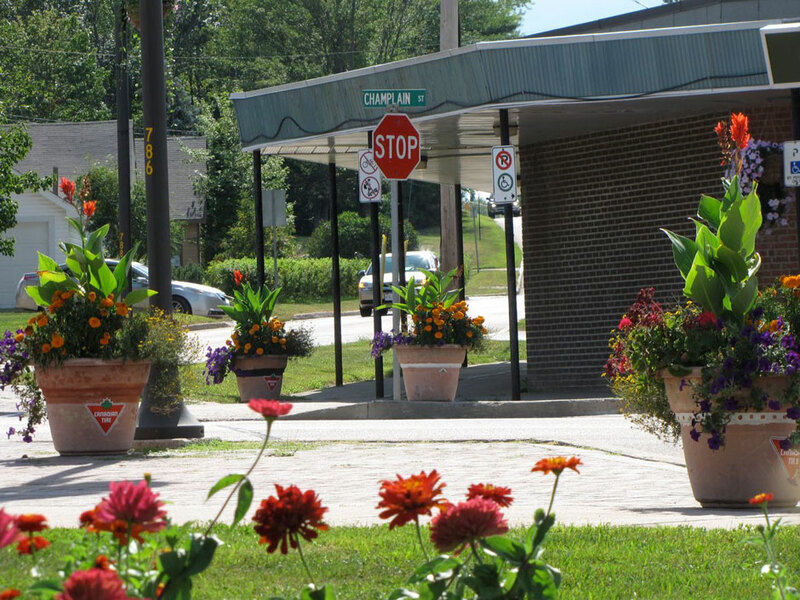 Since 2010, the local Canadian Tire has donated to our container program, offering all of the flowers in our containers, including the two by the hospital. Suggestions for flower selection are always welcome and encouraged. A spring day in the garden with other volunteers to help with planting annuals in the front gardens and then weeding, pruning and general tidying up of the flower beds, both in front of the centre and down on the river side of the building. A volunteer design team and a group of dedicated volunteers have tended the gardens since 1977. In the spring of 2010 our volunteers consulted on tree removal and doing a large overhaul of all of the gardens. On a spring morning in 2011 we offered an extensive consultation with 3 volunteers, the Garden Ladies, who made suggestions for pruning bushes, eliminating some invasive trees and bushes, moving some perennials to fill some gaps and a list of plant suggestions to keep the hospital garden to minimum maintenance. The hospital now has summer staff and a full-time employee to look after the maintenance of the gardens so our volunteers will not be heading to the hospital this spring. Vegetable gardening at it’s finest; tranquil, serene areas with lots of sun and most with water access. Beginner to advanced green thumbs work in their gardens at all times of the day, coming and going as they please, chatting and exchanging tips, garden books and seeds. We can recall our Society members planting in the community gardens long before 1975. 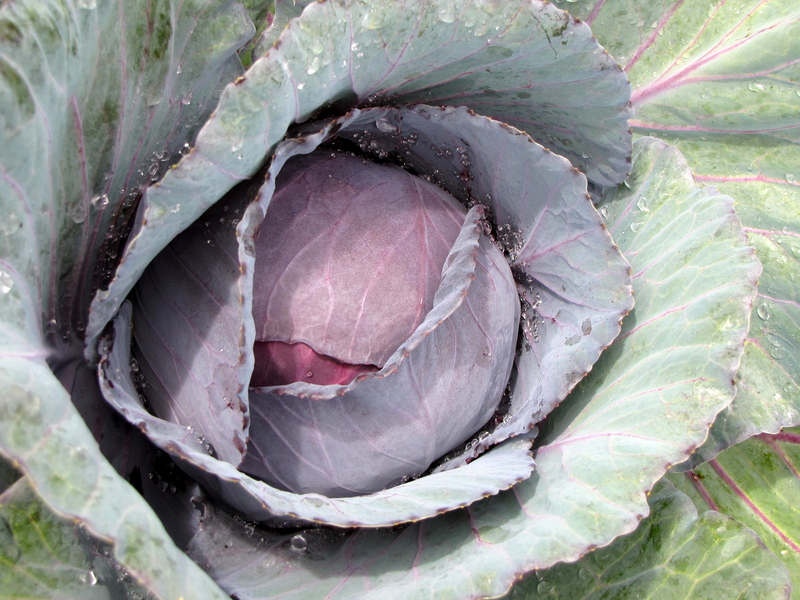 Many, gardening in the plots, have for many years, given fresh produce to the food bank through out the growing season. To rent a garden plot you must become a member. A small fee is applicable. We will contact you in the beginning of May after our membership drive is complete to confirm your plot rental. What a great service this is! It’s been running for 35 plus years. Volunteers look after one or several tools at their home. Do we have tools! We loan out: augers, hedge trimmers, sledge hammer, rollers, sod lifter, spreaders, wheelbarrows, fence stretcher, loppers and more. 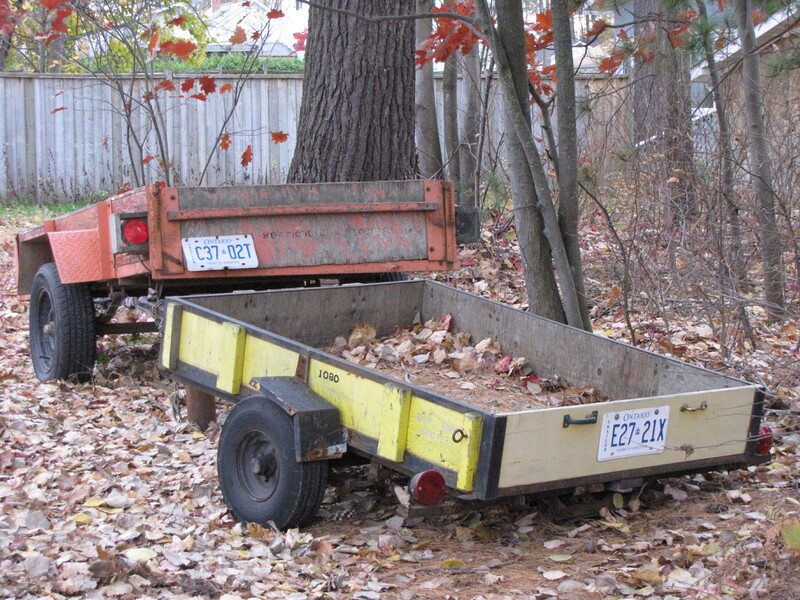 For members, we also have two small trailers for loan for garden use only. There are no overnight loans of the trailers. These trailers are parked for the winter season, except for use in December by the Boy Scouts for their Christmas Tree sales. A complete listing of our tools and contact information is printed in our Yearbook each year. Access to the loan service is included in the $12.00 yearly membership. Yearbooks are given out at the time of signing up for a membership. This year’s District 2 Photo Contest is coming to our doorstep. Why not submit a photo or two (or ten!)? You might win a cash prize and praise and recognition. Be sure that you read the rules with care, if you want to participate. Please note that you must submit your entries to Linda Bartlett by March 31, 2015. The co-ordinator for the 2015 photo competition is Linda Bartlett. Exhibitors must be a member in good standing of a Horticultural Society in good standing within District 2. Entries will be accepted in digital format or print format. They can be mailed to Linda Bartlett, 1060 Ford Road, Perth, Ontario K7H 3C3. Digital photos will also be accepted by email as attachments (one photo per email) to district2photos@gmail.com – Subject line: D2 Photo Competition. Please provide entries in .jpg format with as high a resolution as possible (i.e. do not reduce the size of the file provided from your camera). Photos may be adjusted for lighting and colour balance, but should not be enhanced by adding or eliminating photo elements. Only one entry per exhibitor per class. The same image may be entered only once. Take care to ensure photos are entered into the correct class so they do not get disqualified. Please submit your entries to Linda Bartlett by March 31, 2015. If you wish to have your media (CD/DVD, memory stick) or photos returned to you, please enclose a self-addressed, stamped envelope. Better yet, when you take that great photo, why not email it to the coordinator right away. Your photos will be stored in a D2 Photo 2015 folder under your own personal name and entered into the competition next April. Photos will be projected in a slideshow format presentation at the D2 AGM. Prizes will be awarded at the D2 AGM in Petawawa on April 25, 2015. Prizes for each class (if merited) 1st: $3.00, 2nd: $2.00, 3rd: $1.00. Best in Competition – $5.00. Judging Points Scale: Horticultural Value 40%, Photographic Value 40% and Appearance & Impact 20%. The District 2 AGM is at the Petawawa Civic Center on April 25th this year. Any member of our Society can attend for free. The theme of the day is “Sustainability.” Your day would start with a talk and demonstration by Kevin Nieman, a local florist, musician, and raconteur who will keep you mesmerized as he demonstrates his take on the theme. The D2 Photo competition results and a lecture by well-known horticulturalist, Jay McLaren will precede a free lunch. I, generally, use the time between lunch and the AGM to scope out the vendors’ displays and buy myself a couple of neat items for my home, garden, family and myself. A large number of vendors with a variety of horticultural merchandise have already been booked. Marion always uses this time to check out and bid at the Silent Auction. This year there are too many items to even begin to list but a piece from a local blacksmith valued at $100 has been promised. At the AGM you will have the chance to consider, discuss, question and vote on key issues concerning our Society and our region. After the meeting, the key-note speaker, Mike Johns, will tackle the subject of Sustainability from a manufacturer’s viewpoint. It should be truly fascinating. If you want to attend the AGM, for free, contact Marion Thompson (marionthompson@live.ca or 584-3003) before April 4th. A Farmers’ Market in Deep River! We’ll be selling heritage seeds and garden related items, new and used. This is a wonderful opportunity for the DRAHS to do some extra fundraising by selling donated garden tools, magazines and books. We will also have commissioned garden items for sale as well from local craftspeople and artisans. Bring your seeds to swap. We invite our members: home vegetable gardeners and cut flower growers to sell from our table, eliminating the need for a table and set-up. Just bring your bounty and a chair. This year we have two shows to look forward to. The Deep River & Area Horticultural Society produces a yearbook each spring, which members receive when they sign up and pay for their annual membership of $12.00. Do you enjoy writing? We’re always happy to receive plant and garden related articles for our Yearbook and the website. Tuesday November 13, 2012 @ 7:00 p.m. at the library in Deep River. The guest speaker to be announced later in the year. Come out and put your name or someone else’s forward for the nomination of the executive and board members. It’s a full evening so we start promptly at 7:00 p.m. It’s an opportunity to meet the executive and board members and get a short overview of the successes of the year (details available in hardcopy for those who would like to have more in depth information about our club). We present the winners of our Spring Flower Show and Fall Flower and Vegetable Show with prizes. Stay for coffee, tea and treats and meet our guest speaker and maybe you’ll take home one of our many door prizes. Are you a dynamic speaker who loves to share stories about your garden or expertise? Would you have time to bake a few dozen cookies? Would helping to set-up or clean up the library meeting room be more your thing? We’d love to meet you. Jay McLaren, local horticulturalist and professor at Algonquin College, will be at the Chalk River Library to demonstrate how to prune flowering trees and shrubs on May 3rd. Learn how by watching Mr. McLaren prune in real-time as he outlines the dos and don’ts of successful pruning on a variety of different species. More information will be in the next newsletter. Keep your eyes peeled. Are you an expert in some area of gardening? Do you know someone who would give a great talk on a gardening topic? Please let us know. We have a few dates open for a Speakers Series and we could always add a few extra dates if needed. We like to serve treats and refreshments at our Speakers Series, so would welcome a dozen of your favourite treats to share with others on these evenings. And of course at the end of the evening, if you have 5 minutes to help stack a few chairs that is always appreciated. Or maybe washing up coffee cups is more your thing. The following events are taking place in March and April further afield. They’ll be there all weekend at this annual spring show, to answer your gardening questions. Taking stock of your garden: assess your soil,sun, shade, wind and other environmental factors; and develop a working sketch of your garden. Identify your specific goals by defining your functional needs and your garden style. Creating the structural bones of your garden by defining areas for access paths, decks, fences, pergolas, patios, sheds and water features; choose the colour, size and shape of these garden features to match your garden style. Considering all the important factors when choosing large planting material: trees, shrubs, hedges, and vines. Appreciating good garden design principles and using them to create your personal vision, with all-season interest. Selecting perennials and using their best features to create beauty and that Wow! factor to make your garden a neighbourhood knockout. 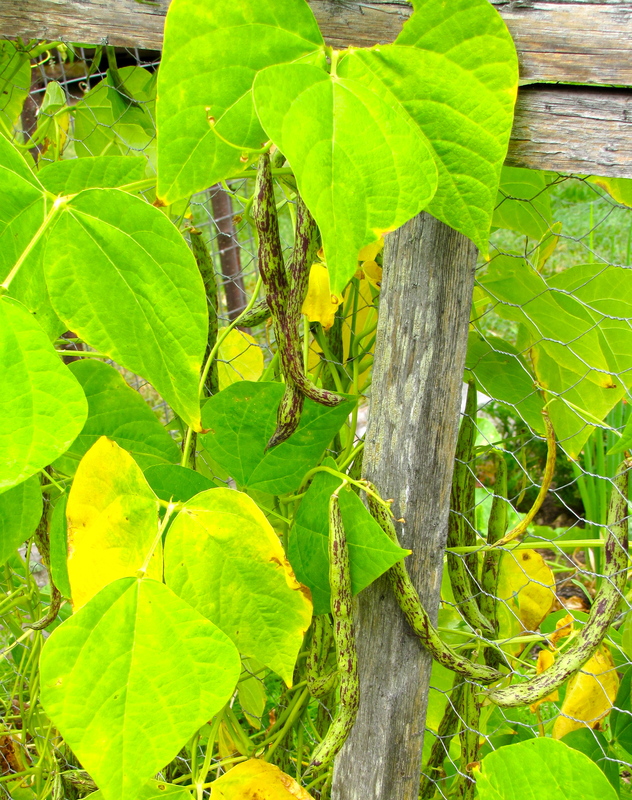 Understanding how your garden matures and what to do to keep it looking its best. One-on-one advice from experienced Master Gardeners will guide you through the practicalities of garden design. Your $60 registration fee covers all costs for the day, including refreshments and a lunch of sandwiches, fresh fruitand vegetables. Seating is limited and early registration is recommended.